One penny on the first day of January, two cents on the second day, four cents on the third day, and so on, doubling the amount you receive each day up to the 31st day of January. On the last day of January you would receive 2**(N-1) = 2**30 or 1,073,741,824 (over one billion) pennies, which is more than 10 million dollars! But it gets even better because we have to sum the pennies received throughout the entire month of January. 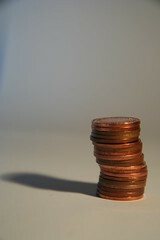 The sum of all pennies received through day N is given by (2**N) – 1, which, in our case, would be (2**31)-1. That comes to 2,147,483,647 cents or, roughly, 21.5 million dollars. Congrats to Simon Banks, Morag Livingston, Mudassir Ansari and Neal Starkman, all of whom wisely chose the pennies. Neal also pointed out the need for penny wrappers and hired help, which presumably can be paid with a portion of your $20M windfall. So a binary 1 which has a 0 added to it for 31 days..
Howdy! I would most certainly taking the cents – assuming you can keep every day’s worth you’d get more than twenty times as much by 31 January – you’d be a multi millionaire… $21,474,836.48 to be precise! I don’t suppose by any stretch of the imagination you could be my rich uncle!! !